With no opportunity to use your hands as a field player in soccer, kicking provides your means of advancing the ball for a dribble, pass or shot. The more types of kicks you master, the more weapons you have during a game. 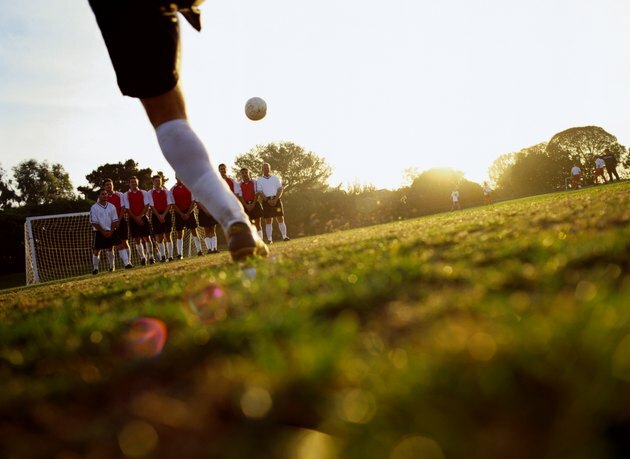 Players such as David Beckham of the LA Galaxy have built their careers on practicing their kicking so that they can land a pass of 40 yards or more right on a dime. You can work against a wall, a rebounder or with a friend to practice the various types of kicks. The push kick, or inside-of-the-foot kick, allows you to send a highly accurate, short pass to a teammate. Players use this pass an estimated 70 percent of the game, writes Jin Wang, coordinator of coaching information at Kennesaw State University in Georgia, in his book "Soccer Made Easy." Contact the centerline of the ball with the inside of your kicking foot held perpendicular to your plant foot, using your foot almost like a golf putter to accurately push the ball. The instep kick relies on the upper surface of your foot, also called "the laces." Mainly used for shooting, the instep kick entails running straight to the ball, placing your support foot beside the ball and swinging your kicking leg swiftly forward. Contact the ball with your laces, keeping your ankles locked. When used by beginners, the instep kick can be inaccurate, so the push pass is often a better choice, according to coach Alan Hargreaves in "Skills and Strategies for Coaching Soccer." Long passing drills involving a static partner and later a moving one can help you work on the instep kick. For long-distance passes or shots, this kick works well, offering slightly more foot contact area and control than the regular laces kick. Run up to the ball at a 45-degree angle, place your support foot beside and behind the ball, contact the ball with the inner side of your instep, and kick the ball with an appropriate force for the ball to reach your target. Lock your ankle as firmly as possible. If you want to surprise and deceive your opponent, who is more likely to expect a push kick, use the outside of your foot instead. Wang says this a kick is more likely to be used and mastered at the elite level. While typically used as a short shovel pass to nearby teammate, once you master it you can also employ the outside kick for shooting, corner kicks or distance kicking. Take a long approach stride and contact the ball with the outside of your foot, keeping your ankle locked. While coaches typically try to wean youth players off toe kicks, they offer another way of moving the ball deceptively. If you want to have the ball travel a short distance for a shot or pass, flick the center of the ball with the tip of your toes, using a quick motion. The back heel kick wins style points for its flair and can be as effective as any other pass, because the defender screened by your body cannot see it well. In fact, given its unexpectedness, a well-placed back heel kick to a skilled forward sets up a fair number of goals. Step over the ball, and poke it to a teammate using your heel.